Reflects your smartphone and your life Smartwatch 3 is a combined state-of-the-art Smartwatch and life logging accessory. Powered by Android Wear, Smartwatch 3 is an intuitive interactive device that feeds you personalized information as you move. It also lets you know what?s going on in your smartphone by way of notifications. When a event is initiated in your smartphone you can view it in detail on your wrist. Powered by Android Wear Contextually aware and smart Android Wear gives you useful information at a glance and responds to your voice. It feeds you relevant and specific information as you move. At a glance, you can view tiny snippets of useful information on the go. If you need to interact with Android Wear, voice input is the best and easiest way. Impressive offline performance Even without your smartphone, Smartwatch 3 is a fun and useful accessory. You can fill it with music to take with you if you?re going for a run. When you?re out, sensors will track your activity and movements to sync with your Lifelong when you come home.Empowering life in detail Packed with innovative sensor technology, the Gyro technology senses direction through rotation, GPS accurately logs location and movement and accelerometer technology can sense if you are walking or running. 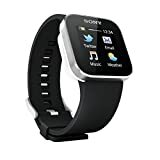 Smartwatch 3 interacts with your smartphone seamlessly via Bluetooth. Smartphone second screen When you get a message or other notification, you can see the details on your wrist. Smartwatch 3 vibrates when something comes in. You never miss a thing. Apps for everything Smartwatch powered by Android Wear is forever expandable. 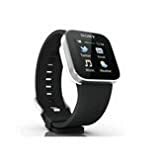 And as developers create new ways to customize and enjoy your Smartwatch 3 becomes increasingly yours and personalized. Designed for can choose from a range of wrist straps - formal, casual, fitness style and they're all made from the finest materials. With a waterproof rating of IP58, Smartwatch 3 can take any weather. 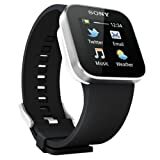 Sony Smartwatch : Fast Shipping!! !